As a homeowner in Las Vegas, NV, you know know important a properly functioning HVAC system is; your family’s comfort depends on it. 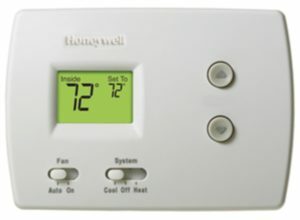 The thermostat controls the heating and cooling of of your living space, so it’s important that it works properly too. Generally speaking, there are two different types of thermostat — mechanical and digital, and we’ll go over both of these in the tips below. If you’re having an issue with your thermostat, the first thing to check is that your HVAC system has power going to it. Check to see if you’ve blown a fuse, or if the breaker that controls your HVAC system has tripped. If everything looks good, head on over the the thermostat. First thing to check (for digital) is if your batteries need to be replaced. Even if they’re still good, now is a good time to replace them with fresh ones. Check the owners’ manual for battery type suggestions as many brands recommend lithium batteries. Before moving forward, you’ll also want to be sure that your thermostat is set properly. If it’s winter, make sure your thermostat is set to “Heat.” During the warmer months, you’ll want your thermostat set to “Cool.” You’d be surprised how often this if overlooked. You should also check to see what your fan is set at. You have two options, “ON,” or “AUTO.” If you select “ON,” the fan will blow air continuously and on “AUTO,” it will only blow when the system is producing hot or cool air. So, which one do you choose? The “ON” setting will constantly move air throughout your home, eliminating hot or cold spots, and since the air is always moving, it will pass through your filter more often. If your system has a HEPA-rated air filter, this can help people with asthma or allergies. The downside is that you’ll need to replace your filter more often, and a constantly running fan will use more electricity and require more maintenance. The “AUTO” setting will only run the fan when the system is heating or cooling your home. This is the most energy-efficient option, and is generally the best choice. You can also set you thermostat to “ON” when you’re home and “AUTO” when you’re away — and get the best of both worlds. But most people don’t want to think about their thermostat that much, so they simply set it to “AUTO” and forget it. Check Anticipator. There is a great article on how to adjust your anticipator. Test or replace the batteries. If your thermostat is wireless, make sure you’re using AA Lithium batteries (or manufacturer recommended batteries). Check thermostat location – if your thermostat is in direct sunlight or close to a heating or cooling vent, it could impact effectiveness. If you don’t want to mess with any of this, give the HVAC experts at Sahara Air Conditioning & Heating a call. We’ll get someone out right away to fix or replace your broken thermostat. Looking to upgrade? Sahara Air Conditioning & Heating installs all Nest products. In fact, we’re one of only two Nest Pro Dealers in all of Las Vegas! 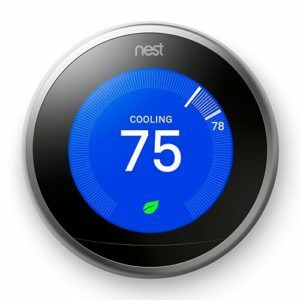 The Nest thermostat works with most HVAC systems and learns from your behavior to save you money. Independent studies have shown an average savings of 10-12% on heating and 15% on cooling bills. Learn more about Nest Products.